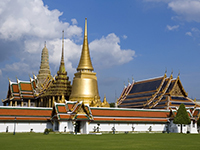 Thailand possesses an array of attractions, with Wat Phra Kaew and Wat Pho two significant Buddhist temples to visit. The vast Lumphini Park and Railay Beach also provide memorable excursions for tourists. All travel is advised against to the Preah Vihear temple area and the Ta Krabey/Ta Moan temple area located on the Thai-Cambodian border by the Foreign Commonwealth Office (FCO). The FCO also advises against all but essential travel to the provinces of Pattani, Yala, Narathiwat and Songkhla on the Thai-Malaysia border. Thailand is very popular with British tourists, with over 800,000 British nationals visiting Thailand every year. Given its 5,862-mile distance from the United Kingdom, Thailand is only accessible by airplane. Flight time from London to Bangkok, Thailand’s capital, can take a minimum of just over 11 hours, but this can increase to between 14-15 hours depending on airlines and stop durations. Thailand is six hours ahead of British Summer Time and seven hours ahead of Greenwich Mean Time, which may require alterations as to how your manage your diabetes. This should be planned for in advance with a member of your diabetes team. The average temperature of Thailand remains at around 28°C all-year round. The currency in Thailand is the Thailand Baht. Foreign Exchange booths are very common, while there are no charges for bringing home currency with you and exchanging it into baht. There are no mandatory vaccinations to enter Thailand, however some are recommended. You should consult your doctor eight weeks prior to your departure in order to receive the vaccinations in time. Some travellers are also recommended to receive vaccinations for other diseases, including hepatitis B and rabies, which can be carried by dogs, bats and other mammals in Thailand. Vaccination against Japanese Encephalitis may also be recommended for travellers visiting remote areas of Thailand for more than a month, depending on what time of year you are travelling. There is no risk of yellow fever in Thailand, although the government of Thailand requires proof of yellow fever vaccination if you have travelled from a country with a risk of the disease. UK citizens with diabetes will not be entitled to any free medication services while in Thailand. Securing comprehensive medical insurance will be essential in order to obtain even basic treatment. You will need to carry your passport and insurance documents as identification to receive treatment. It is advisable to contact the manufacturing company of your medication prior to leaving the UK to find out what is available in Thailand if your medication gets lost, stolen or damaged. It is also worth checking to see what different names your medication may be listed as. You should note which syringes are available in Thailand, with U-100, U-80 and U-40 syringes the most commonly used.